Come to Samoa for its beaches, it's crystalline blue Pacific waters and stunning mountain landscapes, come for its sleepy relaxing nature and to laugh and laze in its endless tropical warmth but make sure you also come for the food!" enthuses Robert Oliver in Mea'ai Samoa ( Recipes and Stories from the Heart of Polynesia). This book is a follow up from his hugely successful Me'a Kai – a South Pacific cookbook which won Best Cookbook in the World in the 2010 Gourmand Cookbook Awards. I was captivated by the gorgeous photographs of the scenery, people and food as well as the stories. They brought back many happy memories of a week we spent in Samoa in the early nineties. "When tourists first arrived in Samoa they preferred European style foods like ham and cheese sandwiches. These dishes were foreign to local chefs. "This was tantamount to an Italian chef being asked to make sushi." and most of the ingredients had to be imported." But nowadays when tourists visit a country they want to sample the local cuisine as part of the cultural experience. 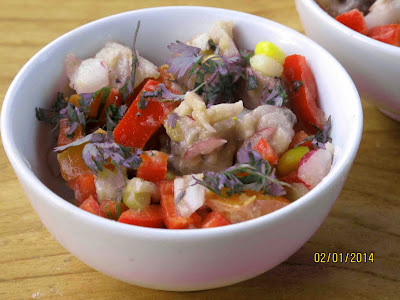 This has helped to fuel a culinary revolution in Samoa. "Chefs and cooks are realising with pride that their cuisine, their rustic home cooking, their lovely way of sharing, their umus and sapasuis, their superb farmers and markets is not only world class, it is in a class of its own." Until I read his book I had never given much thought to the fact that if we as tourists choose to eat local food this has a flow on effect on the economy and creates higher incomes for farmers and fishermen. An added bonus for tourists in Samoa is that almost all the food is organically grown so it is chemical free and healthy. Great food can be found in Samoa but only if you know where to look. This book includes a comprehensive list of where the locals like to eat and where to attend fia fia nights which always feature signature Samoan dishes. A map is provided as well as the best kinds of food to order at each place. Three of the most well known and loved Samoan dishes are included: Sapasui (Samoan Chop Suey), Panipopo (deliciously sweet yeast raised Coconut Buns doused in coconut cream) and Palusami (made with young taro leaves, onion and coconut cream). If you can't lay your hands on fresh coconuts and taro leaves for the Palusami, silverbeet leaves and a can of coconut cream can easily be substituted. From the Pacific Jewel Café in Apia comes a very healthy salad which includes sushi-grade tuna, red onion, cherry tomatoes, watercress, lettuce, cucumber and capers. 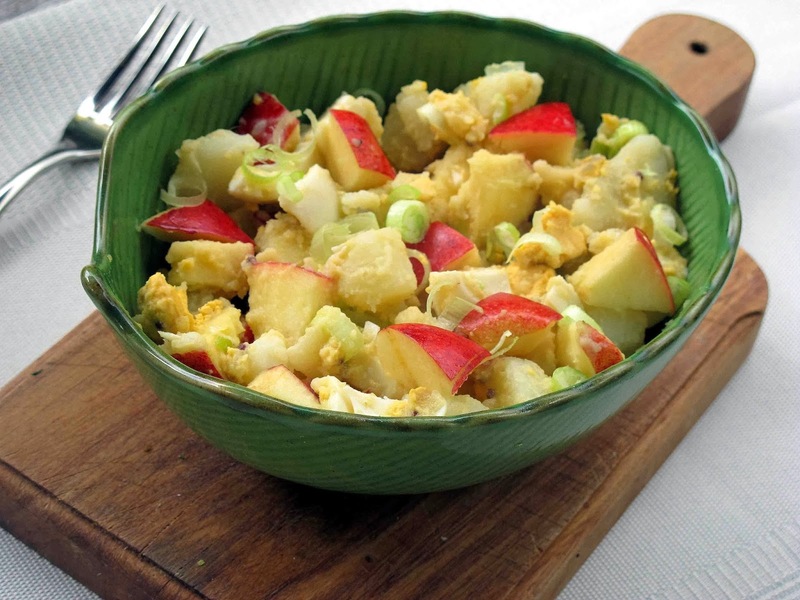 It is tossed with a lemony dressing. Dora Rossi from Paddles Waterfront in Apia has put a spin on a classic date pudding by substituting the dates with dried bananas. 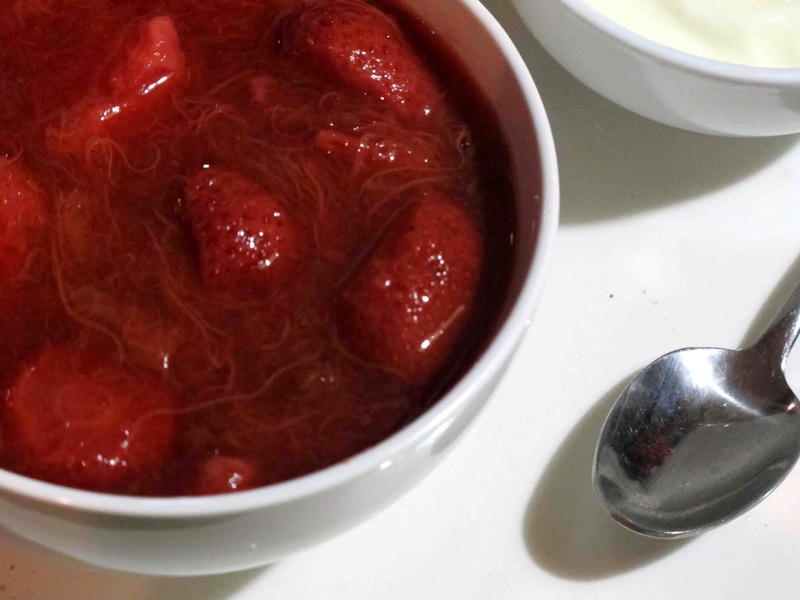 Well known New Zealand Samoan chef Michael Meredith has contributed a summery Samoan Gazpacho which he serves with a Coconut Yoghurt. Beatrice Faumuina shares her mother's recipe for coconut jam. It is easily made from three ingredients (coconut cream, raw sugar and lemon or lime leaves) She likes to spread this as an indulgent treat on a sliced baguette or over ice-cream while it is still warm. 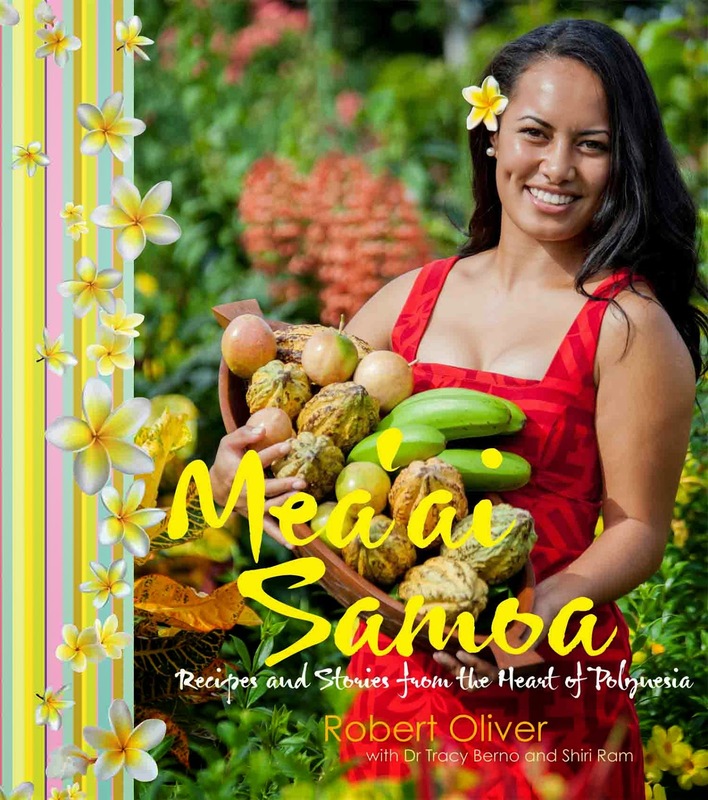 After reading Mea'ai Samoa I'd love to hop on a plane to revisit Samoa and follow the exciting culinary journey which Robert Oliver and his team have mapped out for us. I would heartily recommend it to anyone who is planning to make a trip over there and to all cooks who would like to explore the best of Samoan Cuisine. I'm always on the lookout for silverbeet recipes as its one vegetable which grows in profusion in our garden most of the year round. 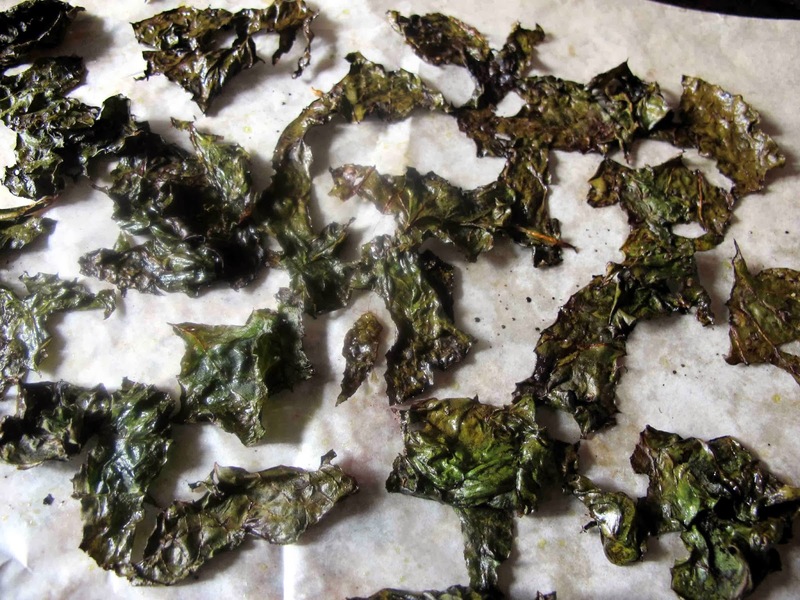 This recipe is just another variation on kale crisps which have become very popular lately, and they are much healthier and faster to bake than potato crisps. Not quite as crunchy as potato crisps but they are flavoursome, especially with the addition of a few drops of Hot Samoan Boys chilli sauce.They make a great pre dinner or after school snack. 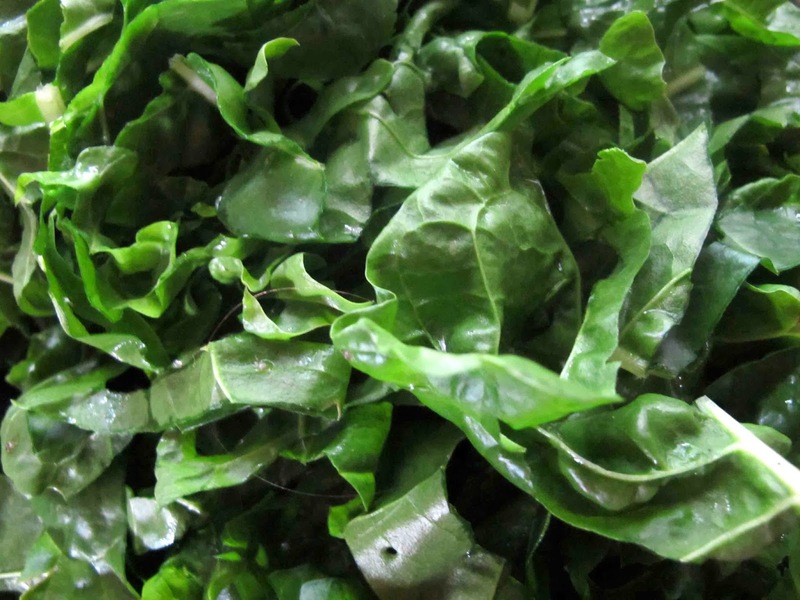 Wash 6-8 silverbeet stalks before using and dry very thoroughly. Wet silverbeet will not crisp up. Cut the leaves from the silverbeet stalks into small pieces. Discard the stalks or use in another recipe. Arrange them in a single layer on a baking paper lined oven tray. Bake for about 15 minutes in a moderate oven. Take care not too burn, they should be a brownish green, not black. If you don't have balsamic vinegar it can be left out. These crisps can burn easily so watch carefully towards the end. If a few of them burn, remove them. Watermelon would seem an unlikely candidate for a salad but with a tangy feta and yoghurt dressing and garnished with mint it worked surprisingly well, and was very decorative. It's the kind of salad that could easily be put together for a barbecue although I wouldn't leave it out in the sun. It tastes better chilled. 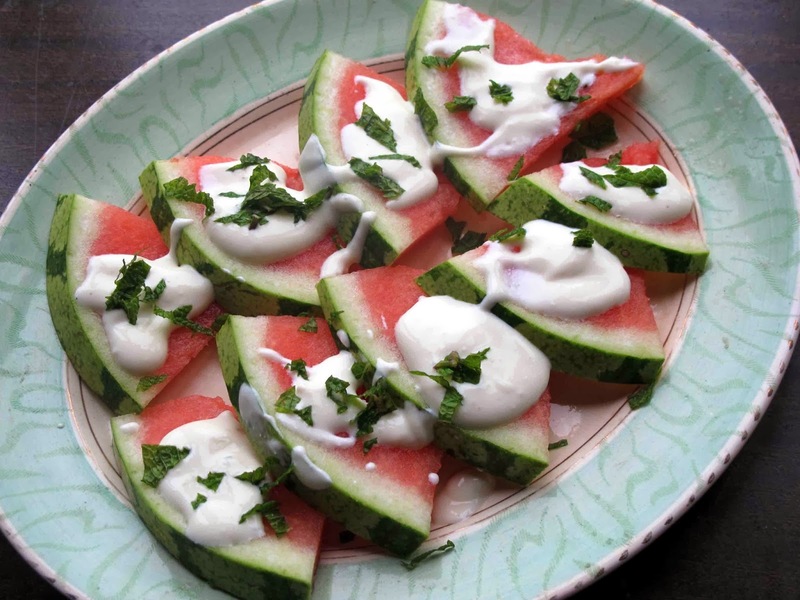 Arrange slices of watermelon on a platter. Drizzle generously with the following dressing. Then chill in the fridge for at least half an hour. Garnish with mint leaves before serving. 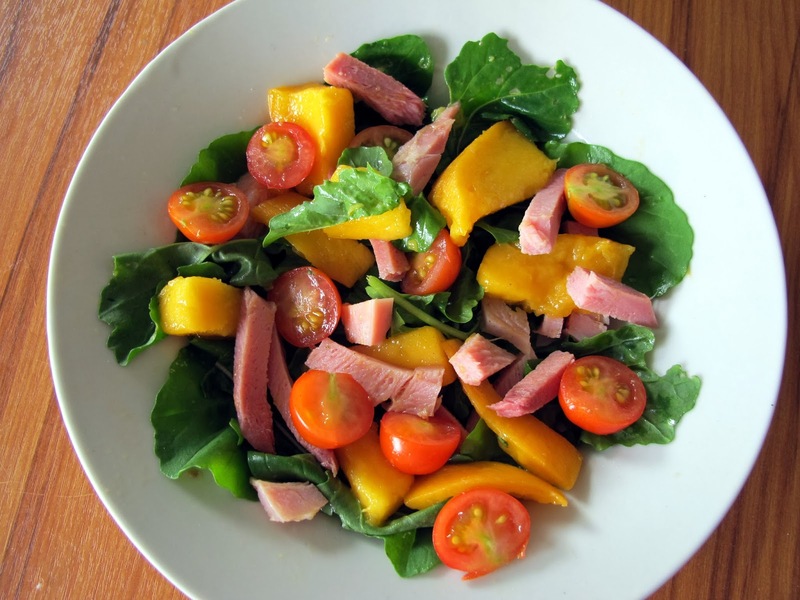 slightly peppery rocket, sweet juicy mango, savoury ham and vividly red cherry tomatoes make a light and summery salad. Drizzle over the honey mustard vinaigrette. Some time ago Alesandra Zecchini posted an idea for a healthy drink on her blog. 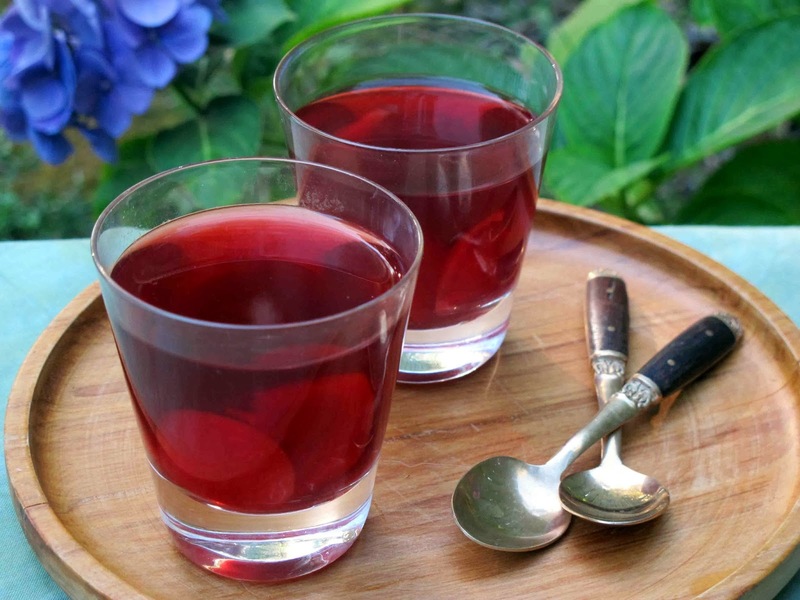 This inspired me to create a chilled summery drink using a roshehip and hibiscus organic infusion from Clipper (a British tea company which can be found at www.clipper-teas.com.) I bought a packet of twenty bags locally to try and loved the flavour, but also the fact that this is a company which makes organic and fair trade products. I used two bags to make enough tea to almost fill a large glass bottle and dropped in some slices of ripe red plums. They were left in for a few hours so the flavours would mingle before serving the fruity infusion in small glasses. Teaspoons were provided alongside so the plums could be eaten as well. Very refreshing!